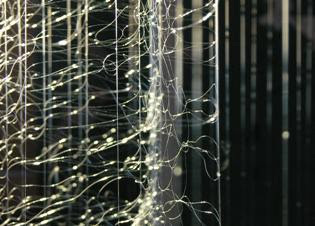 Karilee Fuglem is interested in non-visible phenomena that occupy what we perceive as “empty” space. For more than a decade, her site specific, semi-visible, ephemeral constructions have included materials such as fine monofilament, sequin discs, timers, lenses, water and wind to alter our consciousness about the spaces we occupy. This exhibition is specific to the Art Gallery of Mississauga and is a result of the artist's attempt to relate the Gallery and her work to the night sky... to reference the Gallery space with a universal constant.The artist has mapped out the position of a simple constellation of 6 or 7 stars, Corona Borealis, as it would be seen from the gallery site, from 9-5 on February 29th, 2008. Through a system of nearly transparent thread lines, Fuglem makes tangible a nearly imperceptible constellation and a leap day, a time frame that is often regarded as some kind of gap in "real life". This experimental laboratory created in the gallery by Kristen Keller will allow students of Cawthra Park Secondary School to work directly with her constructing robotic structures. These mechanical mongrels are fabricated out of found objects, rescued materials and recycled plastic. 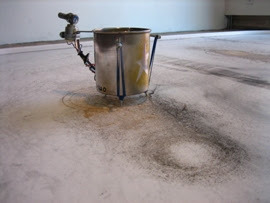 Outfitted with drawing utensils motorized to make marks on flat surfaces these robots independently make paintings and drawings of their own. In collaboration with Cawthra Park Secondary School and InterAccess Electronic Media Arts Centre. The Art Gallery of Mississauga would like to acknowledge the generous support of Deserres, Oakville (formerly known as Loomis Art Store) for their contribution to MONGREL MEDIA.